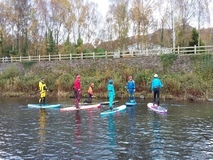 The BCAB Paddlesport Leader Training is a 2-day course. The BCAB Paddlesport Leader Assessment (PSLA) is a 1-day course to assess 2 x candidates or a 2-day course to assess 4 x candidates. The primary role of the Paddlesport Leader is to lead, to supervise, or facilitate safe, quality, enjoyable trips in a ‘sheltered water’ environment based on their group’s needs and aspirations. Safety, quality and enjoyment will primarily be achieved through choice of venue, equipment and leadership strategies that match the group’s specific needs. The award does not include progressive coaching of technical skills but focuses on learning through experience. One of the main responsibilities of a Paddlesport Leader is to use their skills and judgement to select appropriate trips/journeys for the paddlers they work with. These decisions will be based on their own abilities and skills, and the profiling of their group’s needs and aspirations. The qualification is designed such that the Leader can choose the craft from which they work, and can look after others in both single discipline and mixed fleets. This may include for example; touring kayaks, open canoes, suitable sit-on-tops, general purpose kayaks, stand-up-paddleboards, crew boats, or racing craft.